4 chambres, 2 salles de bain, chalet au bord du lac! Plage de sable plat avec une rampe de mise à l'eau privée, un foyer et un grand porche. Super endroit; plein de soleil et des vues incroyables. Profitez de votre propre plage privée / quai; parfait pour la baignade, la pêche, le kayak et le canotage! Ce chalet dispose d'une cuisine entièrement équipée, WiFi et câble. 8 personnes; 1 lit queen, 1 complet et 4 lits jumeaux (oreillers et couvertures sont fournis). Porche arrière idéal pour griller et recevoir, grand soleil matinal Si vous cherchez des vacances amusantes et relaxantes, c'est parfait pour vous! Attendez de le voir, vous allez adorer! My family and I stayed at Linda’s home and had a great vacation! The house is clean and well cared for. Square Pond is one of the CLEANEST lakes you can rent on. No scary, yucky stuff in the water. I can’t think of any reason for you to not move forward with booking this house for your own trip. We had 2 small kids with us and the beach was perfect for them to play. We rented a pontoon boat from Parker’s and they delivered it right to us! Linda was accessible for questions and we enjoyed meeting a lot of her family. I frequently rent from Home Away because hotels are not ideal for our child with food allergies. This rental did not disappoint! We will be back! Thank you so much for such a great review. We really enjoyed having you and look forward to seeing you again. Appreciate you taking such good care of the camp, you are always welcome! So grateful to have such amazing guests, thank you for coming and look forward to seeing you again. My wife and two kids were here for a week in August. We got out on the boat every day. My daughter (4) swam all day, the end of the dock was deep enough for her to jump from and the beach was shallow and gradual enough for her to play and make sand castles. The beach was also gentle and shallow enough for my 10 month old to just sit in the water, play with toys and try to eat sand and rocks. My wife and I rocked on the porch at night, did some provided puzzles, and were able to get our streaming device to work on the internet. To help you plan ahead, the local stores don't have much and the closest hannafords is 20 min away (stop at Emily's pizza on your way back). Willy's (the shed) is only about 5 min away. It has a ton of seating, seat yourself, that the cooks cant keep up with, so at dinner time you will get a table immediately but have to wait at least 45 min for your food. The food was good though. They also have a small butcher shop/convenience store. Teds fried clams is about 10 min away and is very casual. It has a huge menu you order at the window, and the food comes out quickly. There is a separate window to order lobster, steamers and chowder. There is another window (both inside and out) for the ice cream shop. Everything was really good. The house had everything we needed to cook all the stuff we got from Hannaford's and reheat the left-overs from the restaurants. The fridge has an ice maker which was nice to have. My daughter told me last night that she wishes we were still at the vacation house, and I just said me too. Would come back in a heart beat. Linda is an amazing host! Her spot is just perfect no matter what your age. We had people age 1-81 and all were happy and comfortable! We loved this place so much we are coming back again in 3 weeks and again next year. The best renters and new friends!! Thanks so much for picking our camp, we were thrilled to have you and look forward to seeing you again. Wonderful cottage on pristine lake! Our family (7 adults and one toddler) enjoyed a week on Square Pond at this quintessential Maine cottage. It is truly a place where memories are made as you take in the beautiful lake views and distant mountains. 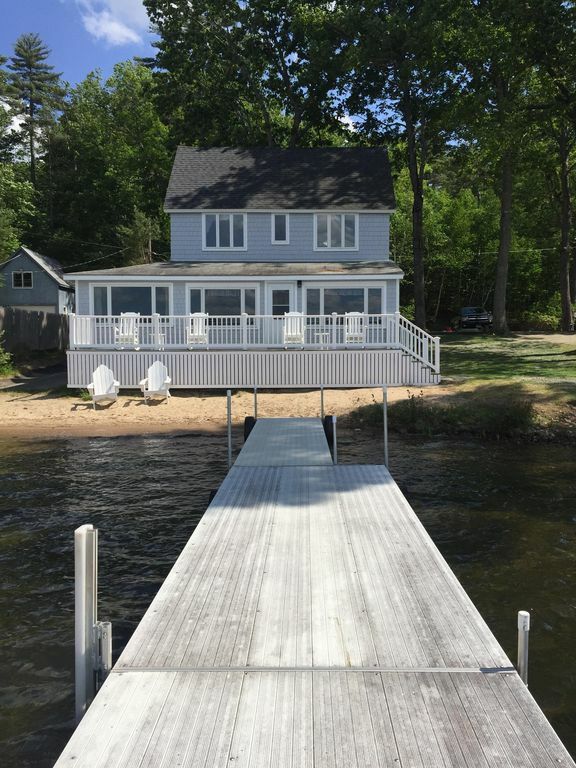 The cottage is well maintained and has all the amenities you need for a relaxing week at the lake. Kayaking, swimming, playing on the sandy beach and watching the loons were the highlights of our vacation. The owner, Linda, was a pleasure to work with and responded immediately to my initial inquiry about the rental as well as a few additional questions I had prior to our arrival. Mary, the pleasure was all mine! Enjoyed meeting you and your husband and am so happy that it worked out for you. Love to have you back anytime! Enjoy the rest of your summer and thanks for making Square Pond one of your memories! Great house with everything you need! Beautiful sandy beach and swim area. Square Pond is a great, clean lake to swim, boat and enjoy. Owner, Linda was most awesome to work with and quickly responded to any questions or requests. Highly recommend this wonderful lake location! Thanks so much really enjoyed meeting you and your family and so happy that you had a great vacation. And must say you were the perfect “renter” thanks again.